In ancient times, secret messages where send to distant places using codes so that a third person who tries to read the message couldn’t be able to understand the content of the message. The one who is supposed to read the letter only knows the code for reading the sentences. He will be informed with the logic behind the coding and he could easily understand the message. Such coding is used in modern society too. Our mobile recharging using numbers will also be like that. Each number will be conveying a meaningful word. That’s why when we try to recharge by randomly enter the number it gets failed. In GATE exams, such coding decoding type questions are asked. Coding is important type of reasoning questions. In this section codes will be used to designate or represent a word and we need to identify the pattern of the code. Some logic will be there behind each coding. If we identify it easily the section is completed easily. Gateway academy, gate coaching center in Kochi give tips and tricks to decode the code easily and score well in this section. The coding done can be classified into different types. Coding using letters, number coding, coding by substitution, mixed letter coding, mixed number coding etc. In letter coding questions, each alphabet will be replaced by another alphabet. This replacement will be based on one rule. For example, replacing every alphabet with its next alphabet i.e. B for A, C for B like that. We will be given a word which looks like meaningless when we read but after decoding it will be familiar word. Ex. DVQ for CUP. In number coding alphabet will be replaced by numbers. Questions will contain a word and its numerical representation and we will have to identify the representation of another word using same logic that is used for the given one. Ex 1 for A, 2 for B…. ACE represented as 135 or 357. Logic behind 137 is the order of each alphabet and in case of 357 adding 2 to its order. Like that questions can be of different logic. This is only example of a simple logic. When the logic gets complicated, the question also gets complicated. Another type of coding is substitution. In this a word or object will be substituted with another word. For example, sand for apple orange for sand and question will be what we eat. Even though sand is against the fact but with respect to code sand is the answer. 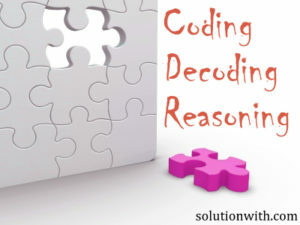 In mixed letter coding three or four sentences will be coded in a particular manner and we will be asked to identify the code for a particular word which is there in any one of the sentence. In these questions, we need to compare the sentences and code and identify the common ones and find the code for the required word. Same is the case with the mixed number coding. Some sentences will be coded with numbers and by considering all the sentences we have to identify the certain word. So these kinds of questions which check our ability for reasoning is included in this section. Gateway academy, gate coaching center in Kochi deals with developing the reasoning ability.